So here’s the deal: whether you rent or buy your tux, you’re going to want to want to wear your own shirt. 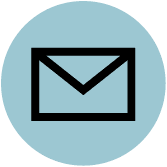 No, it’s not crazy – think about it. Do you really want to rent a shirt that has been worn—and sweated in—by multiple other guys you’ve never met? 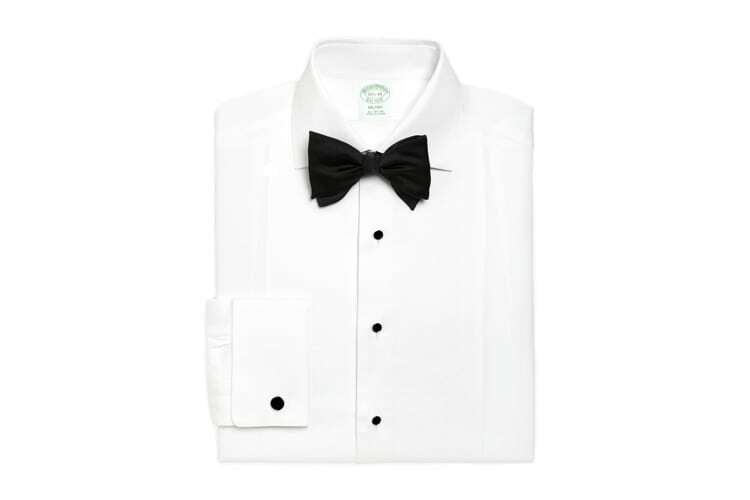 Do yourself a favor and find a good, classic, go-with-just-about-anything tuxedo shirt to can hang in the closet and be ready-to-go, whenever duty calls. 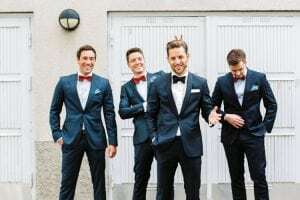 This idea may seem foreign to a lot of grooms or groomsmen, but a good way to bite the bullet and create uniformity on your side of the aisle is to find a great, well-fitting tuxedo shirt for you and your entire crew. 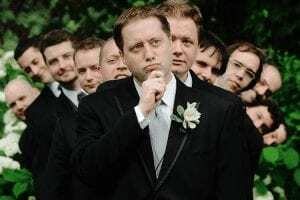 Give your groomsmen the gift of not having to worry about someone else’s armpit funk invading their territory. “But there are so many tuxedo shirts!” we hear you say. “Where do I start?” Don’t worry, stosh: The Plunge went ahead and did the heavy lifting. Take a look through the 9 best tuxedo shirts for the big day, and any day after requiring a step up from the stiff, boring, white button-front. This is the way to bring traditional and modern together in holy matrimony. 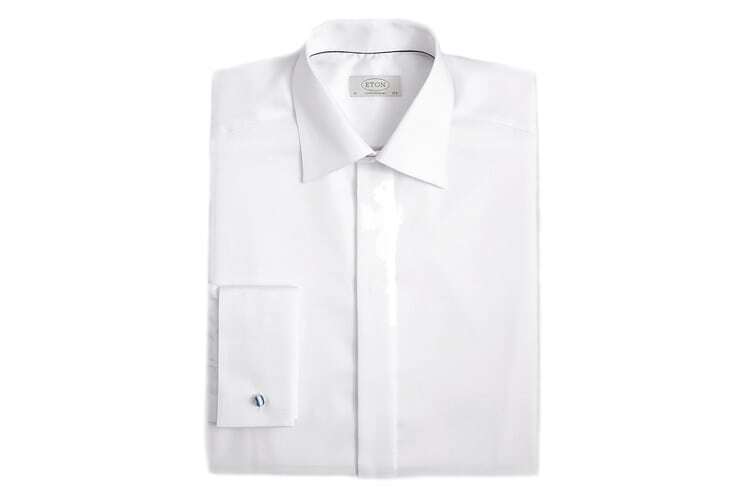 With the traditional collar and double cuff, but with a more modern piqué bib front, this longer, slimmer style appeals to the modern man who has an appreciation for tradition, but doesn’t feel the need to comprise his personal taste. This shirt is perfect for the man who either wants to add another shirt to his tuxedo arsenal or get only one and be done. 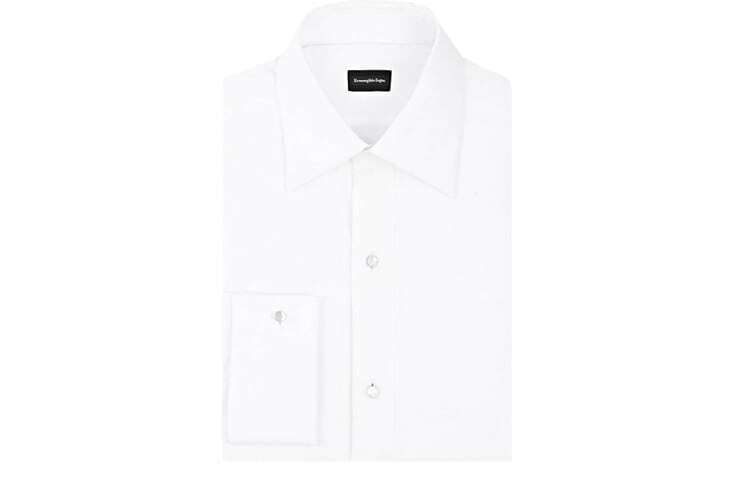 With a covered placket and classic fit, there is no need for studs and with a cuff that works with cufflinks or it’s own buttons, it’s OK if you are too busy to even remember to grab them. 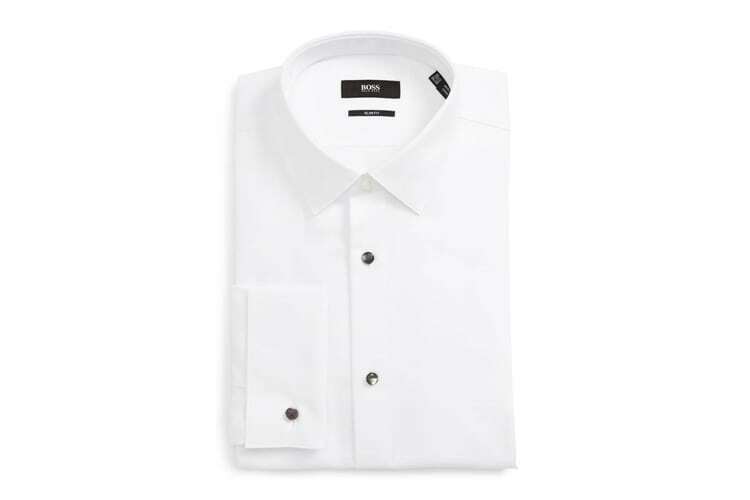 Add to that the special weave of the Eton fabric that prevents it from creasing, and you have yourself the go-to travel wedding shirt. A favorite among suited men for the great fit and value, Boss never fails to deliver. 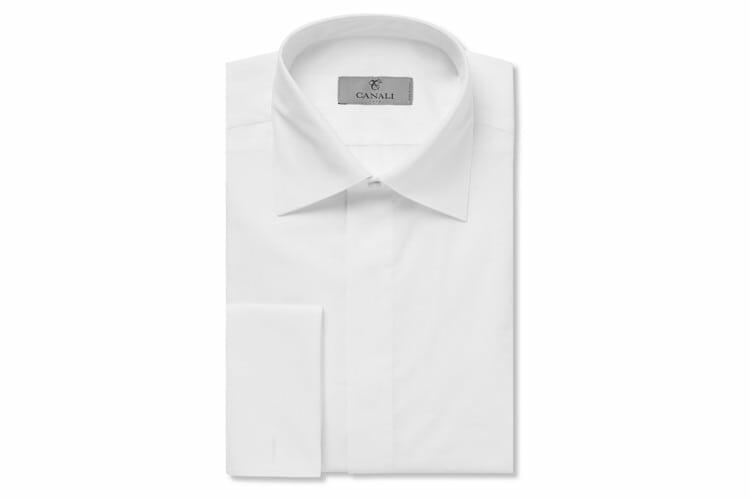 This shirt, with it’s shorter cuff and micro-diamond weave, is cut trim so it’s perfect for a slimmer, leaner build. A French placket keeps the front clean, but receptive to studs, and the shorter, more traditional collar works with any tuxedo lapel. Nothing says heritage like the classic herringbone weave. 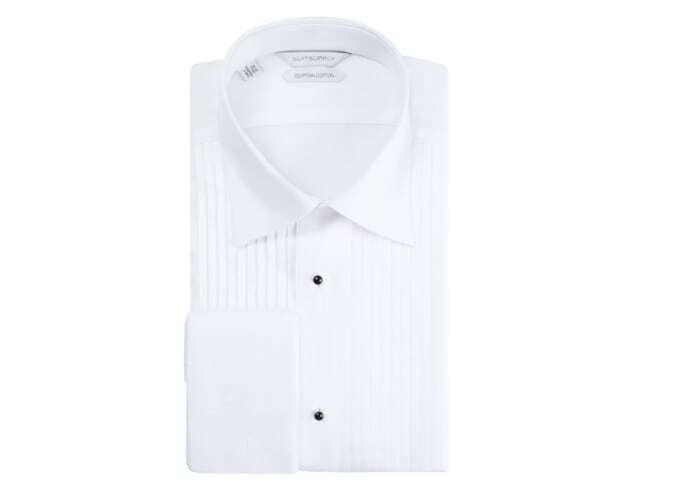 Traditional and upscale, this elegant shirt isn’t going to bring the wedding budget to it’s knees. A great option for all the guys to get or to be given as a gift, this is shirt is affordable and available in two fits: slim and standard – everyone’s happy! Brooks Brothers knows what they are doing when it comes to dressing up. Weddings are no exception. 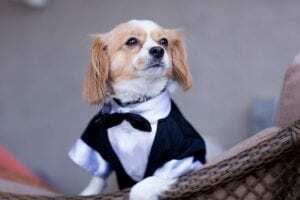 The small weave bib and the incredibly clean French placket and spread collar allow for a stylish entrance to your big day, be it your wedding, or you best bud’s. Allowing for the generous American sizing of Brooks Brothers, it’s a great option for dad. Don’t be afraid to call that tailor of yours. 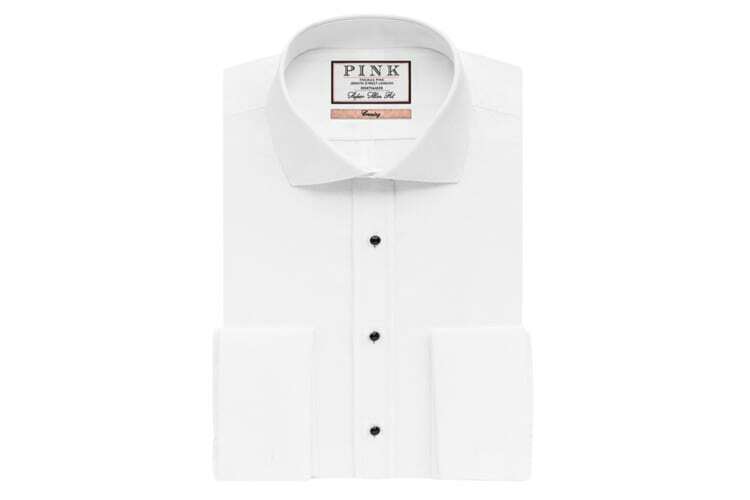 The slimmest offering from Thomas Pink, this modern, contemporary tuxedo shirt has a semi cut-away collar which makes it one of the most modern looking on our list. 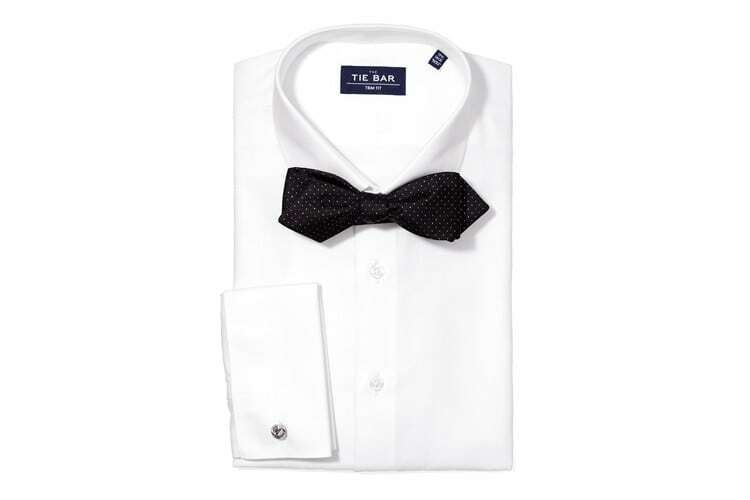 Perfect to be paired with a sizeable bowtie and substantial lapel, this shirt will impress everyone on your guest list. There is a reason why you haven’t seen a pleated shirt on our list until now (and why you won’t see one again)–they look great, sure, but they also tend to look dated. The current trend has been to either keep it clean with no sort of weave or pattern, have an understated subtle-textured bib-front, or go all Ryan Gosling a la 2017 Oscars in Gucci (yep, guys want to go Gosling at their weddings). We, however, do not recommend this. Leave it to the pros and their teams of “yes men”. You want to bring a little something unexpected to your tux? The traditional pleat has now become, well, unexpected. This is as clean as you’re going to get, guys. No bells, no whistles, just 100 percent Italian cotton and class. You don’t need studs in this number, you’re the only stud here. In this case, less is more, and the more you bring, the better. Charles Tyrwhitt may not be custom, but it’s pretty damn accommodating. A base price of $99 (or two for $80) allows you to add a little sleeve length for a few bucks more, meaning you can get a shirt to fit those freakishly long arm of yours. But, you know what they say about guys with long arms, right? They like Charles Tyrwhitt dress shirts. 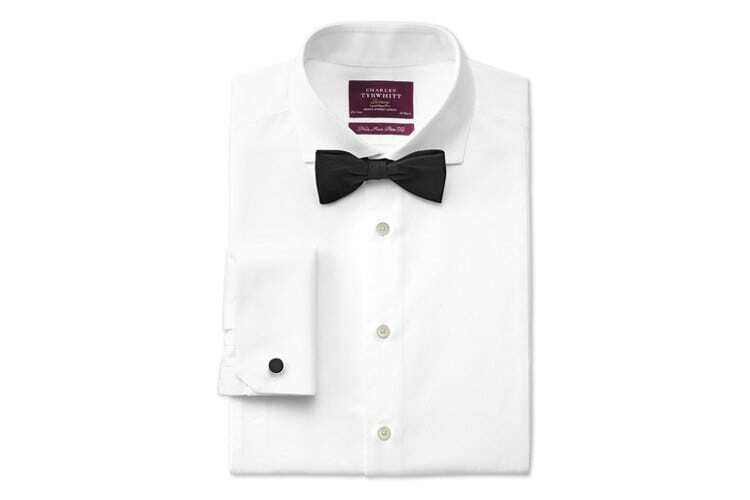 Tuxedo shirts are an intimate garment you shouldn’t rent if you don’t have to. With all the styles out there now, you can get a tuxedo shirt that fits like your favorite dress shirt for about the same amount of cash.